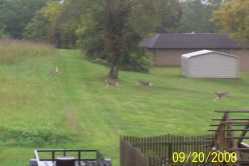 This group of deer ran through the field behind our backyard off of Old Hopper Road on Sat. Sept. 20th about 8:30 AM. The white deer (in first picture submitted) was with this group.